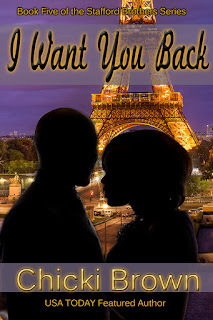 The amazing Chicki Brown has released book five in her Stafford Brothers Series, I Want You Back and she is sharing and excerpt with us today. Let's take a peek at Nick Stafford, shall we. Once he was inside the familiar surroundings of Cher’s apartment, Nick drew a long breath and the tension began to ebb from his neck and shoulders. He used to spend so much time at her place, but it had been months since he’d last been there. A brief glance around the living room reassured him that everything was still the same. She had a gift for the domestic arts. Even though her living space was small, it was comfortable and cozy. For some reason, even when he couldn’t relax in his own apartment, being at Cher’s always helped him settle down and unwind. Or maybe it was simply her presence that soothed and calmed him. Only this time, when she closed the door, an uneasy silence filled the room. They stared at each other for a long moment before she spoke. He removed his suit jacket and slung it over the back of the chair he used to consider his and eased into it with the unwelcome thought that Derrick had probably claimed it too. The notion made him so queasy he jumped up and moved to a seat at the kitchen table. Cher turned toward him with a confused expression and poured him a glass of sweet tea from the pitcher she always kept in the refrigerator, but she didn’t say anything. “Why don’t we order something to eat?” he asked. “Yes, please.” She sounded thankful for the suggestion. It was obvious that she was trying to make light of the matter. She kept her back turned to him as she spoke. Cherilyn immediately relaxed and rested back into his embrace. He wanted to let his hands roam over her curves, but it was probably too soon. Just this morning she was preparing to marry another man. He didn’t want her to feel as though he was pushing her. “I’ll call and order dinner.” He released her and stepped back. Instantly he felt a void at the loss of her warmth. He sighed and reached into his pocket for his phone. Nick didn’t have to ask what she wanted. This restaurant had been their favorite, and they always requested the Best of Italy Trio with lasagna, fettuccini alfredo and chicken parmigiana. He wasn’t sure how to begin the conversation, so they waited in silence with only the sound of the television filling the apartment. When the doorbell finally rang, he got up to answer it, paid the delivery man and set the bags on the table. The aromas of tomato and garlic from the unopened containers filled the room. “This smells wonderful.” She opened each item, and Nick spooned their food onto plates then took her hand and offered a quick blessing. Nick mulled over her words for a moment then nodded. “That’s fair. It’s what you deserve, but don’t expect any gourmet dining or weekend trips to South Beach on a resident’s salary.” He added with a mirthless chuckle. It's great to be here to share with your readers, Te'. Thank you! I'm delighted you put me out of my curiosity. So Cher did not wed Derrick. Thank goodness. I like Cher putting down her feet now with Nick. Thanks, Stella! Your name is in the hate to win a Kindle copy of the book. Well, since Stella is the only one who posted a comment, she is the winner! Congrats! Thank you so much, Chicki for the gift. I'm so chuffed. I can't wait to read Nick's story.